Ice cream trucks sometimes freak me out. Years ago I wrote a story about a La Puente ice cream man who was also the neighorhood molester. He got busted and we ran the story way inside for politically correct reasons. 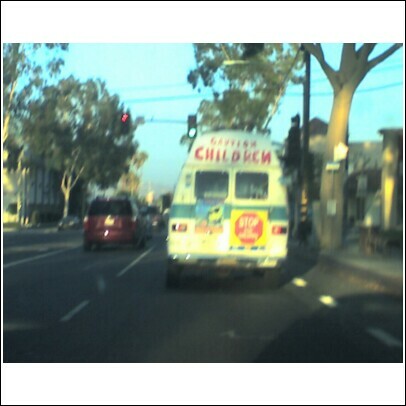 Anyway as I was driving home Wednesday night I got behind this ice cream truck and it’s large warning that read CAUTION CHILDREN. I was wondering about the lack of puncuation. Should it read Caution, children. Or Caution. Children. This entry was posted in 290 by Frank Girardot. Bookmark the permalink. That’s interesting…our ice cream man was busted for pushing drugs..What the hell? This leaves me wondering about your abilities as a writer and your lack of spell check. You complain about punctuation and you misspell the word itself. How funny is this? Do you know how silly all the misspellings throughout your blogs make the staff look? Maybe I can give you guys a seminar on how to use spell check.